My husband and I are big fans of both cooking shows and movies about restaurants, so we were excited to see Burnt. While it let us down as a movie, it did provide a great example on why conflict and stakes are vital to a story. It’s also an example of why a novel that is well written, has a solid idea, all the right pieces, might keep getting rejected. Burnt is technically well done. Amazing cast, great actors and acting, good production values, strong writing, solid bones in the story—what it lacks are the fundamental elements of good storytelling. If you happen to have a manuscript out now that’s getting “it’s well done, but…” rejections, you might find some reasons why here—and some clues on how to fix it. 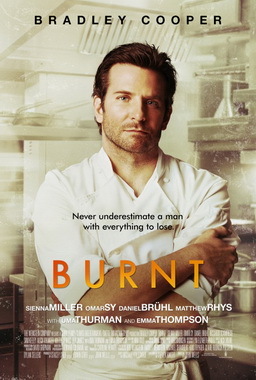 In Burnt, Adam Jones (Bradley Cooper) is a chef who destroyed his career with drugs and diva behavior. He cleans up and returns to London to redeem himself by spearheading a top restaurant and gaining three Michelin stars. That’s the movie. You no longer need to see it, because it unfolds exactly as that summary says. There are no surprises, twists, turns, or even stumbles off the clear Point A to Point B plot. What we can learn from this: If the entire plot can be summarized in one or two sentences, that’s a red flag there are no surprises in that plot (this is different from being able to summarize the conflict in one or two sentences. That’s a good thing). Be wary of a plot that’s a series of predictable steps to getting what the protagonist wants. Adam has all the makings of a wonderful character with past problems hurting his future—he’s a talented chef with a rough past who threw it all away and is desperate to regain what he lost. He burned bridges and ruined relationships, and pretty much did everything he could to ensure he’d never work as a chef again. The struggle for redemption is right there, rife with a ton of inherent conflict. None of his past matters. Nothing he did then has any ramifications on what he wants to do now. There’s no antagonist. No one is standing in his way of getting his stars. The only obstacle he faces is that he has to randomly wait for the Michelin people to show up. A sous chef he wants to hire doesn’t want to work for him. He needs a past colleague he screwed over to work with him again. He has no money to start his restaurant and his reputation makes him a bad risk. His own personal failings as a human being. Seems like great problems to overcome, right? But nothing is actually a problem. He speaks to the restaurant owners and the sous chef gets fired so she can work for him. And she does. And stays, even though he treats her like dirt. His old boss vouches for him, and as long as he takes a drug test every week and goes to a therapist he’ll back the restaurant. Adam is a Gary Stu character for sure. What Adam wants, Adam gets, no problems whatsoever. He doesn’t have to struggle to overcome anything at all. His “flaws” don’t hurt him even though they should. He’s actually admired for being a royal jerk. There’s a hint of potential conflict at the end of act two where the Michelin people (who dine in secret) come to the restaurant, and the colleague sabotages Adam (just like Adam did to him). Adam has a huge meltdown, he thinks he’s going to get a bad review, let alone that third star, and goes on a bender. Classic Dark Moment. Even though there’s been no conflict yet, there’s hope that now, things will turn against Adam and he’ll have to struggle to finally win. 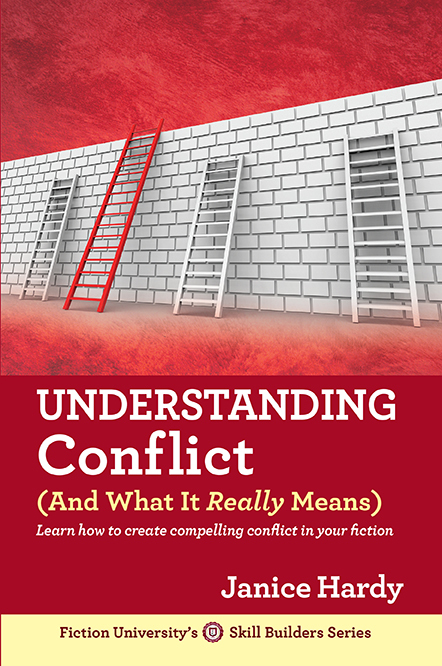 What we can learn from this: Conflict makes a story. Without conflict, there is no story, no matter how good everything else is. Stories are about characters struggling to achieve goals. If there’s no struggle, there’s no story. Adam’s meltdown should haven been a major deal. It should have been the end of him, the rock bottom he might not be able to climb back from. Adam has to take a drug test every week and talk to the therapist to get his loan and keep his restaurant open. It’s made very clear that if he screws up, he’s out. And he screws up big time. And nothing happens because of it. He doesn’t get tested, he doesn’t get into any trouble for falling off the wagon. His therapist never even finds out. The only stated stakes in the movie were fake, as they never held him accountable for anything. Had that whole aspect not been in the movie at all, it would not have changed anything. In fact, it turns out that the diners they all thought were Michelin people were just regular diners. The colleague that sabotaged him didn’t do Adam any harm at all (another fake stake). So there he is, hungover and feeling crappy, when the real Michelin people show up and he has to serve them. Which he does and gets his star. Easy peasy. His only obstacle is that he’s hungover after his rough night of drugs and alcohol. Gee, it’s a good thing he has an entire staff of highly trained chefs to make the meal under his guidance. Adam sets out to get his third Michelin star. What happens if he fails to get his star? He feels bad and has to keep trying. That’s it. Nothing happens to him, he doesn’t lose his restaurant, his reputation is already ruined so he doesn’t even lose that. He still has his well-reviewed and always packed restaurant where he’s doing what he loves. Adam: I want someone else to back me to open a restaurant so I can get three coveted Michelin stars. Viewers: What’s in the way of you doing that? Viewers: What happens if you fail? Viewers: Then why are we watching this? Sure, I’m a fan of Bradley Cooper, but I need more than that to enjoy a movie. This is particularly sad because the tagline for this movie is “Never underestimate a man with everything to lose.” He has nothing at risk, ever. Even if he loses, so what? He starts over and tries again, since it’s obviously easy for him to start a fabulous restaurant on a whim. What we can learn from this: If there’s nothing to win or lose, what happens doesn’t matter. And when you have stakes, make sure the consequences are real and actually happen if the protagonist fails. Some movies can overcome a lot of these things if the characters are awesome and we just love hanging out with them. Problem here, is that Adam is an arrogant, rude, selfish, jerk. There’s not a single redeeming quality about him. He’s mean to everyone around him, takes what he wants when he wants it, and even though they tried to create a romance subplot with the sous chef to show Adam’s “softer side” it doesn’t work. He still makes the poor woman work on her daughter’s birthday. The token, “after I get everything I want I’m a little nicer and more human” at the end doesn’t make up for everything that comes before it. Or feel real, because he doesn’t learn or earn any of it. He just decides he wants it and he gets it. As a viewer (or reader), why do I care if this horrible person gets his dream? I don’t, which is why the movie was a letdown. What we can learn from this: Unlikable characters can work, but only if there’s something compelling about them, or there’s a sense of redemption for them. Putting horrible people who get everything they want with no effort just puts readers off. Nobody likes those people. It’s always a shame when a story with everything going for it falls flat, especially when a few minor tweaks would have made all the difference. If Burnt had had a strong conflict and real stakes, it would have been a terrific movie. But at least we can all benefit from its mistakes. 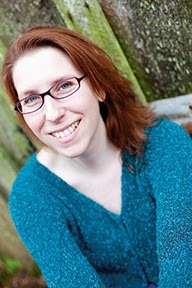 If you’re concerned about your novel, ask yourself: Do you have a protagonist struggling to get something, or just a story that shows them getting something? If it’s all about the getting and not the struggle, you’re probably setting yourself up to get burned. Did you see Burnt? What did you think? What other examples of these issues have you seen or read? I haven't seen Burnt but it seems his kind of character is more acceptable these days, not just in movies but some commercially successful books. I've been seeing that as well. I blame House actually. It seems like it started when that show became popular. Excellent assessment. I haven't seen Burnt, but I've heard others who did complain about it. You've given me a lot to think about for my WIP. Stakes are so crucial to keep a reader invested in the story. The lack of stakes was the critical issue with my story. Though I had agents interested in reading the whole thing, they bailed at the lack of high stakes. So now I'm rewriting the book. Try looking at how the problem can be personal and life-changing for your protagonist. Often, the stakes are there if we dig and the story doesn't have to change much at all. You might only need to tweak the protagonist a little to make it all work with little rewriting. Sounds awful, but instructive. And it does sound like it was meant to be a hollow but brilliantly-executed story, but missed the execution. Jerk characters do bother me. In real life making the hard, considerate choices works, but often too slowly to be enough fun for a story. Meanwhile we see or hear about people who tear around putting themselves first, and it seems to work for them, at least from a distance... So they make movies about one who might have a moment of comeuppance, and then instead gets to stay in jerk mode all story. Sorry, Hollywood, I *don't* admire divas like that. I think we were supposed to care about Adam because he "was awesome" but we were never given any reason besides that. I'd bet the writer knew why he was worthy of the story, but it never made it to the page (or screen). Totally with you on the jerk characters. They can be jerks, but give them something redeemable as well. I've been editing my current project to put in more and better conflict, so that section resonates with me right now. Thanks! Glad it helped! Good luck with your editing.